Hi Holiness examining the placard offering best wishes from the children of Maitreya School, Bodhgaya, India, January 2017. Photo by Bill Kane. Lama Zopa Rinpoche typed out advice (see below) on how to celebrate His Holiness the Dalai Lama’s birthday (July 6). In the advice, Rinpoche discusses what prayers to recite and in what order, remarking that “doing [these prayers for His Holiness the Dalai Lama] will help your practice very much; you will get the realizations of the path.” Rinpoche later requested that this advice be given to all FPMT centers, projects, and services. FPMT International Office has collated Rinpoche’s advice into this booklet—How to Do the Great Festival of His Holiness’ Birthday in the Best Possible Way. We hope that this booklet, which contains all the advice from Rinpoche’s letter, will help you organize a beautiful and meritorious celebration for His Holiness’ birthday. “Start from LA MA SANG GYÄ and the refuge and bodhichitta verses that I added. Do the verse for purifying and blessing the place; visualize that the place becomes like a pure land. Then do the invocation followed by blessing the offerings. Offer them together with LHA DANG MI YI CHHÖ PÄI DZÄ, the long [Offering Cloud] Mantra, [and the Power of Truth]. When the cymbals are played, they should go around three times. They should be played slowly, not fast, as if you have to run for pee-pee! “Then do the Seven-Limb Prayer. In the monasteries, they would do the Seven-Limb Prayer from the King of Prayers, which is longer, but since people in the centers are not familiar with this, they can do the short one that we normally do. Stop a little bit at rejoicing, then finish [the Seven-Limb Prayer]. “Then do [the long version of His Holiness’] long life prayer. It can be chanted like we usually do for long life prayers, or like Losang Gyäl Tänma (Prayer for the Flourishing of Je Tsongkhapa’s Teachings) is chanted during the Monlam Chenmo (Great Prayer Festival). I led this chant during the Bendigo retreat. Or you can do the common quick way of reciting it. “After that, you must recite the Sixteen Arhats Prayer.1 Requesting the Sixteen Arhats to grant long life is very powerful. Recite it one, two, or three times. For Sixteen Arhats Prayer, there is no slow chanting; you can recite it like it is normally recited. May you live showing us a healthy long life until our samsara ends. May all your holy wishes succeed immediately. Until I achieve your state of full enlightenment, buddhahood. “This request includes the prayer from Lama Chopa (LC 53) KHYÖ NI LA MA, KHYÖ NI YI DAM, KHYÖ NI KHA DRO CHHÖ KYONG TE…, and Calling the Guru from Afar by Kyabje Phabongkha Rinpoche. The meaning is that you request the guru to guide you until your death, in the intermediate state, and in all future rebirths, and in every day, every hour, every minute, and every second. This shows that this time we are the most fortunate ones. We can’t believe how fortunate we are. Just look at the rest of the people in the world, without counting the people in other universes. This prayer is also important in order to be able to follow His Holiness up to becoming oneness with His Holiness the Dalai Lama’s holy mind. This prayer is the most important one because if from your own side you don’t follow Him, His Holiness cannot guide you. 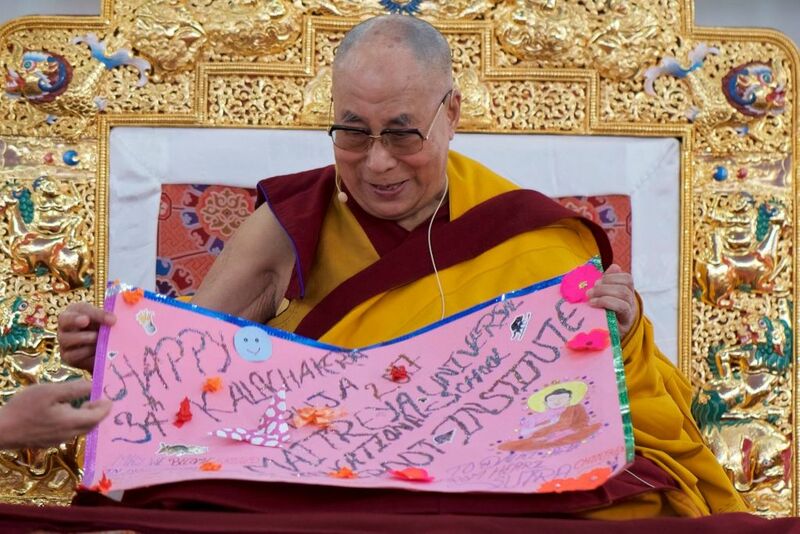 “This prayer is not only for His Holiness’ birthday, but can be done whenever you offer a khata to His Holiness’s picture or take blessings from him. “All these prayers should be chanted. “During the long life prayer and Sixteen Arhats Prayer, the rest of the people can go to take blessings [from His Holiness’ throne]. You don’t need to be quiet while people are taking blessings; [you can recite these prayers]. “Tea can be served during the long life prayer, as well as sweet rice. You can recite JAM PÄL PA WÖI NGAG LA WANG GYUR ZHING and so forth for the tea offering. The tea offering prayer is in the English of Lama Chopa combined with Jorcho. After that, for the rice offering prayer, recite in Tibetan: SANG GYÄ YÖN TÄN SÄM MI KHYAB / CHHÖ KYI YÖN TÄN SÄM MI KHYAB / PHAG PÄI GEN DÜN SÄM MI KHYAB / SÄM MI KHYAB LA DÄ JÄ PÄI / NAM PAR MIN PANG SÄM MI KHYAB / NAM DAG ZHING LA CHHÖ PAR BÜL. “After that, if you desire, you can recite DAG SOG KHOR CHÄ TSHE RAB THAM CHÄ DU and so forth. It is very good to recite it. The last line of that verse, KÖN CHHOG SUM GYI JIN LAB JUG PAR SHOG, contains a request to generate all the realizations from seeing the guru as a buddha, correctly following the guru with thought and action, which is the root of the path to enlightenment; the common path, the three principal aspects of the path to enlightenment; and, in particular, the two tantric paths, the generation and completion stages; up to enlightenment. “[At the end,] you can do other [dedication] prayers. Do the short one that I normally lead, TSHE RAB KÜN TU GYÄL WA TSONG KHA PÄ and so forth. Then do MÄ JUNG NAM THAR TSANG MÄI THRIM DANG DÄN and so forth. Do PÄL DÄN LA MÄI NAM PAR THAR PA LA, KÄ CHIG TSAM YANG LOG TA MI KYE ZHING and so forth once again at the end to receive the blessings of the guru to develop devotion and respect toward the guru from now up to full enlightenment. “Dedicate the merits for the world to have perfect peace and happiness. Recite the first verse from Eight Verses to be able to cherish every sentient being, from each realm, more than the sky filled with wish-granting jewels. “Recite GE WA DI YI while doing the meditation of sealing [the dedication] with emptiness. Then, chant Final Lamrim Dedication or Losang Gyäl Tänma (Prayer for the Flourishing of Je Tsongkhapa’s Teachings) like I usually lead them, or, do them without, chanting, depending on how much time you have. This is talking in general but, if there is time, it is also good to do Tän Barma (Causing the Teachings of Buddha to Flourish). If you do it, then do Final Lamrim Dedication at the end. Thank you. “If there is time, someone—the lama or geshe or even a student—can speak about who His Holiness is and about his kindness, so that people’s minds feel very connected to His Holiness. Prostrations and Offerings to the Sixteen Arhats (Neten Chagcho).